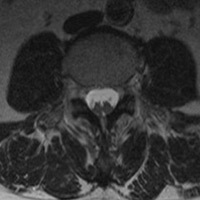 A 56-year-old woman presented with chronic back pain. Figures A (sagittal T1) and B (sagittal T2) show low-lying conus medullaris and a small intradural lipoma (at the level of L3-L4) as well as a sacral meningeal cyst. 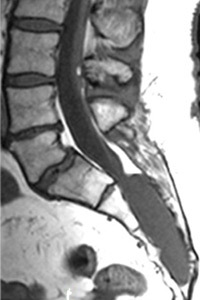 Figure C (axial T2) shows a syringomyelia (at the level of L2), and Figure D (axial T2) shows diastematomyelia (at the level of L4). 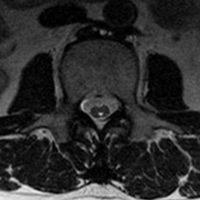 Figure E (axial T2) shows a thickened filum (at the level of L4-L5) as well as a sacral meningeal cyst, in Figure F.
• Tethered cord syndrome is defined as a spectrum of congenital anomalies resulting in an abnormally low position of the conus medullaris that may lead to neurological, musculoskeletal, urological, or gastrointestinal abnormalities. • Clinical presentation in adults includes lower extremity nondermatomal pain, often referred to the anorectal region; urinary and bowel movement disorders; spastic gait; and muscle atrophy. 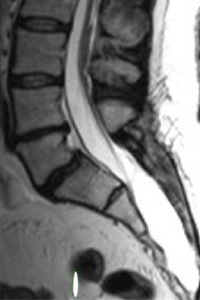 It may be subclinical until aggravated by factors that increase tension, such as trauma, disc herniation, or spinal canal stenosis. 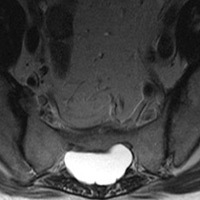 • MRI is the modality of choice for diagnosis. 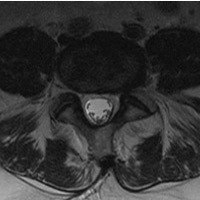 The most common findings in adults are low-lying conus (below L2 vertebra) with intra- or extradural lipoma and a short, thickened filum terminale greater than 2 mm in diameter. Less common findings are split cord malformation and a dermal sinus. CT and plain X-rays are helpful for the evaluation of scoliosis in adolescents. • Differential diagnosis are (not limited to) degenerative joint disease, spinal cord tumor, syringomyelia, and cord compression. • Treatment mainly is surgical, especially when the patient presents with neurological deterioration. — Pedram Parva, MD, is an attending radiologist at the Boston University School of Medicine and the VA Healthcare System in Boston as well as a radiology instructor at Harvard Medical School. Hertzler DA Jr, DePowell JJ, Stevenson CB, Mangano FT. Tethered cord syndrome: a review of the literature from embryology to adult presentation. Neurosurg Focus. 2012;29(1):E1. Moriya J, Kakeda S, Korogi Y, Soejima Y, Urasaki E, Yokota A. An unusual case of split cord malformation. AJNR Am J Neuroradiol. 2006;27(7):1562-1564. Gupta SK, Khosla VK, Sharma BS, Mathuriya SN, Pathak A, Tewari MK. Tethered cord syndrome in adults. Surg Neurol. 1999;52(4):362-370.